Starring: Vanessa Kirby (Mills), Thure Lindhardt (Captain Bukes) and David Ajala (Drifter). In a near future technology-reliant society, a small, elite army unit is helicoptered to a remote, off-the-grid island facility. What starts out as just another training exercise for Captain Bukes (Lindhardt) and his tight-knit squad, descends into a terrifying battle to the death, as the marines discover the island is overrun by an enemy that transcends the human concept of evil. What’s more, they might have a mole among them. At the last possible moment Bukes is forced to accept a civilian observer delegated from one of major sponsors, a digitally modified woman, closer to computers than to humans…will she be an asset or a liability? Or maybe both? Ok, let’s leave helmets, provisions, backpacks and move forward. The premise seemed interesting enough as it focused on the said Specialist Mills, a bionic creature with an implant of special brain tissue in her head. Allegedly a big company, seeing her potential, saved her from a life as a cripple when she was just eleven. She was supposed to be torn between her humanity and the fact that she also belonged with cyborgs and computers – I saw it as the main source of much-needed tension. If the director developed that aspect of the movie well I would be willing to forgive him a lot. Unfortunately for a reason or two Mills wasn’t allowed to play a bigger role. As far as I am concerned there were two good scenes with her: first showing the woman as a supervisor of a kind of robotic production line and then when she switched on and talked to a kind of digital cyber warrior. Soon, to my irritation, the Marines had to save her like any damsel in distress which was not a denouement I was counting on. Not a bad sci-fi movie but also one which could have been much better. I hate it when a film wastes its potential (those blue circles rock btw). Meh. 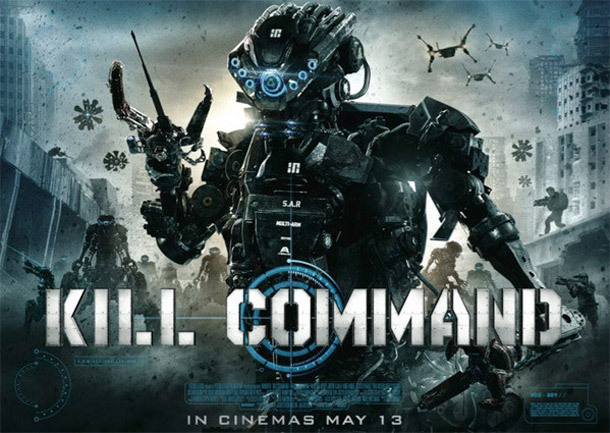 This entry was posted in fantasy action movie, movie review, sci-fi and tagged great CGI, kill command, meh, movie review, steve gomez. Bookmark the permalink. Damn plot holes. Ruining everything. LMAO! At first I thought it said this was directed by “Selena Gomez”. I need a nap! Oh, I haven’t heard about this one. Will check if it’s on Netflix or Amazon Prime. It should be there I suppose – have fun!